the material selection process and planning. Our installers bring your vision to life. of day create beautiful variations. options for functional and decorative touches. is right for your project? Coping is the edge of your swimming pool or spa. It can match or contrast the decking. you map out and implement your project. fountain to enhance your swimming pool. Poolscape Unlimited offers the full range of pool and spa re-plastering and renovation services. 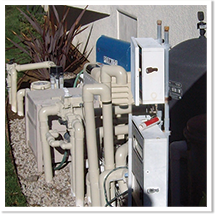 This includes anything from restoring the functionality of an older or damaged pool, to giving your swimming pool and or spa a makeover or adding a new feature such as a Baja shelf or water feature. 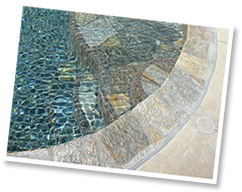 Our complete line of pool interiors come from 30 years of involvement in our industry, research and continued exchange between some of the top pool finish contractors in the nation. Choose from the cost effective and smooth Commercial Quartz plaster finish or a full line of ultra resilient Gemstone pebble pool finishes in a wide variety of beautiful textures and colors. Gemstone Commercial Quartz Blend, Micro Fusion, Radiant Fusion, Gemstone, Sandstone, Designer Gemstone, Gemstone enhanced with Pebble Radiance. Changes in lighting throughout the day create beautiful nuances in the reflected color of your pool and spa. Visit our gallery for pool photos. 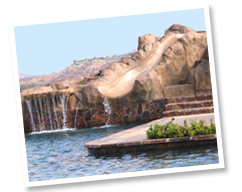 For a detailed palette of all finish types and colors available, please visit the Gemstone Pools site. 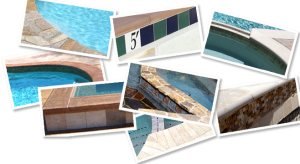 We have selections available from six of the top pool tile vendors in the nation. Create that designer pool by blending the colors from your coping, surrounding hardscapes and pool interiors. From the most subtle natural appeal, to the shining iridescence, we have the tile for you. Visit our gallery for pool photos. Consider a variety of options from Acid Color Staining, Stamped and Textured Overlay, Veneer with Tile or Natural Stone, or removal and replacement of concrete. We have many structural options that can enhance or change the look of your pool, these structural options include: addition of a spa, baja benches, and step and entry configurations. Other custom structural innovations can be considered. Check out “The Process” page to see the steps involved in the addition of a new baja shelf. Rock waterfalls and sheer descents can add a beautiful dimension of sound and visual appeal.